Tokai Forum - a subsidiary of TokaiRegistry.com :: View topic - advice on ebay guitar please! advice on ebay guitar please! Posted: Tue Mar 30, 2004 11:41 pm Post subject: advice on ebay guitar please! Just bought this guitar. It was advertised as "lawsuit" model. it's headstock says tst-56. I didn't read the description so carefully and now I see it says "post lawsuit" Is this guitar a good model? I hate to have to not pay for it, but I wanted one of the "lawsuit" models and thought that's what it was from the Title. yes- I think it's one of those "in between" lawsuit models judging from the headstock. I think it's going to be a good guitar. I just got a little worried because I have to pay for it tomorrow. I'm not usually lucky at ebay, but this time I think I was. It was pretty sneaky of the seller not to show the entire headstock. Just to clarify the 'lawsuit' point - there wasn't one unless you count the one against Ibanez. Tokai were threatened by fender because they used the word 'strat' on the headstock of one particular model. 'Lawsuit' has come to mean any good quality, accurate MIJ replica made before the mid-80's and it's an overused buzzword. in Japan the Van Zandt maker puts the True Vintages into ash bodies. I have a set in a strat I own and like them very much. In fact, I have 3 sets of VZs in strats and they are my favs. I own a Bacchus strat with VZs very much like the one in the pics but with a rosewood fingerboard. Looks real nice to me, I think you done good. I'm thinking about taking the Vintage Pups out and putting the Blues VZ pups in instead. Are VZ's marked accordingly so I can sell them? This may still be an excellent guitar (most Tokais are), and the Van Zandt pups & CTS pots etc are good quality. But if you were hoping for a collectible instrument, or as you put it a ?Lawsuit model?, then I?m afraid you?ve made a mistake . Note what Paladin says about (i) sellers not showing clear photos of the entire headstock , and (ii) misleading use of the word ?Lawsuit? ? see my footnote. 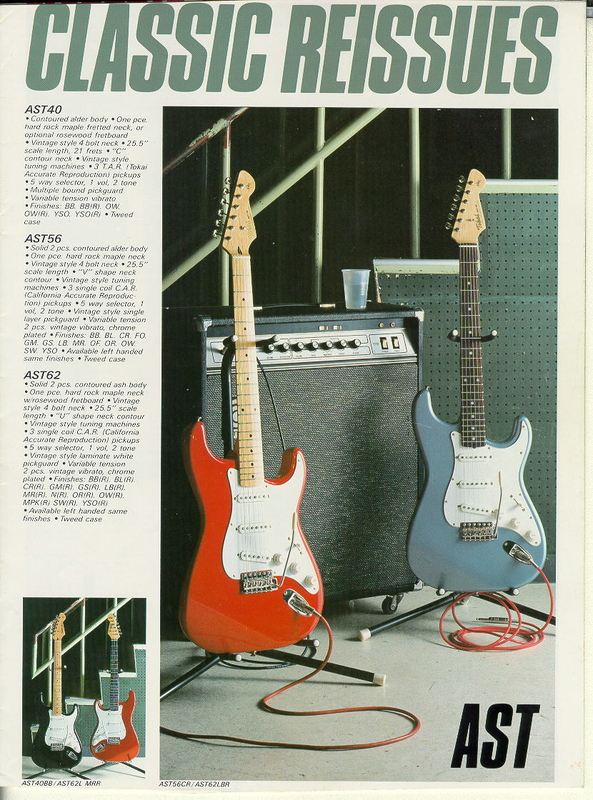 It?s difficult to say if any Tokai guitars will ever become truly collectible, however, if that?s what you wanted then you should have bought a pre-1982 Springysound, and made sure it was all original (ie no Van Zandt pups or CTS pots etc.) . Footnote re.?Lawsuits? ;- AFAIK, the true story is like this;- firstly there never was a lawsuit. All that happened was; about 1977 Gibson?s distributors (Norlin) threatened legal action against the makers of Ibanez. As a result of that, Ibanez and other Japanese makers made a tiny change to the shape of the Les Paul headstock. Apart from that, it seems Fender & Gibson continued to complain about Japanese copies, and eventually companies like Tokai changed things like the shape of the headstock & misleading decals such as "7okai" & "Les Paul Reborn" etc. Thus, as Paladin says - the term Lawsuit is now used (incorrectly) to mean any identically-shaped copy guitar from the late 70?s to early 80?s ? it?s a sales ?pitch?. It's not the collectable part that I was interested in. Maybe for a future purchase I'll get a springy sound. I just wanted a great playing strat and great sound. I'm thinking about getting the Van Zandt Rock pickups put in now that I've done more research.................Anybody tried these pups? i have a set of van zandt vintage pickups. they sound exactly that,,,vintage. the rocks are going to be a hotter pickup. i've since gone with fralin real 54's....the van zandts are going to dallas in a couple of weeks as trade or sell fodder. I saw an 80s LS 120 here that sold for 128000 yen this week, more than it would have originally. They already are collectable here in japan. another LS200 went for 228000 yen. hell, i tried to buy a 79 lp reborn ls120 last week for 131k yen...didn't reach the fecking reserve! i decided i have 2 1980 ls80's, i'll just buy a gibby cs 336 instead.